A pint of beer is a science class in a glass. On the macro level, there are the biology and chemistry lessons: fungi and plants collide to kick-start the fermentation process that produces alcohol. And the individual characteristics of those fungi (yeast) and plants (hops and malt) each affect how a beer will taste. When grabbing a cold one at the package store, most people aren’t thinking of these intricacies, but The Botany of Beer, a two-hour class held at Polly Hill Arboretum this Saturday, aimed to change that. “Hopefully you’ll walk away from here appreciating beer even more than you already do,” said Julie Jenney, who co-hosted the class with Polly Hill executive director Tim Boland. Ms. Jenney is the educational programs coordinator at the Scott Arborteum in Swarthmore, Penn. The duo began teaching the class in 2009, but this was the first time the class had been taught on Martha’s Vineyard. The 25 attendees sipping lagers and ales in the Far Barn at Polly Hill represented a cross-section of beer drinkers. Several home brewers were in attendance, along with those who knew next to nothing about beer other than that they liked the taste. Polly Hill educational outreach administrator Karin Stanley started navigating the process in February. The brews for the class could only be purchased wholesale, and had to be delivered straight to the arboretum; they couldn’t be picked up. 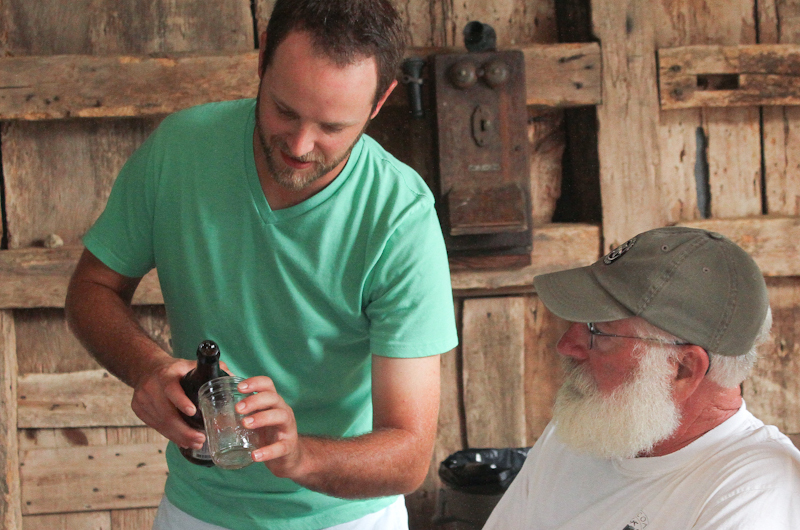 Mrs. Stanley and Polly Hill horticulturist Ian Jochems were both certified as alcohol servers; the two circled the tables of the Far Barn throughout the class, pouring samples of seven different craft brews into small mason jars. Peanuts and crackers were on hand to help cleanse the palate between brews. The beers ranged from the summery yellow of Hennepin, a farmhouse saison brewed by Ommegang in New York, to the amber of Whale’s Tale Pale Ale, brewed on Nantucket, to the deep chocolate of the Anchor Steam Porter, brewed in California. Each had been selected to represent a different component of the brewing process. The Whale’s Tale Ale and its more alcoholic cousin, the Centennial India Pale Ale, provided the segue into hops talk. Hops are an extraordinarily productive plant. In peak season, they can grow up to a foot per day. Female cones of Humulus lupulus, a member of the Cannabacae family (also in this family is the cannabis plant), were originally added to beer to act as a preservative, Mr. Boland said. But they also provided the bitter tang that gives beer its distinct flavors, balancing out the sugars produced when yeast breaks down the malt. Members of the grass family, like the barley that is used as the main component of malt in beer “enable so many of our food systems,” Mr. Boland said. Barley is used because its husk malt gives beer its color, as well as its flavor; roasted malt provides a darker hue, like that of the Shakespeare Oatmeal Stout sample. Dogfish Head Craft Brewery began making Ta Henket in 2010. It is an attempt to replicate the first beers ever brewed, in ancient Egypt. There is no foamy head on this beer, which is flavored with chamomile, doum-palm fruit and herbs, and has a low alcohol content of 4.5 per cent by volume. Attendees piped up with suggestions for what the Ta Henket tasted like — clovey, spicy, peppery. “Is it hard to drink?” Ms. Jenney asked to a resounding No. “People are inclined to think beer is beer,” said Bill Strecker of West Tisbury, who attended the class with wife Nancy. The class did a great job breaking down the topic, he said. Nancy, a gardener, said she enjoyed the botany lessons. “It was a great place to have it, she said. " I can't believe I missed this! I love Polly Hill and Craft Beer. No Offshore Ale? Any chance of a repeat? Beertakes center stage on Saturday, Sept. 22 at the Martha’s Vineyard Craft Beer Festival.